Subaru has a long history of making off-road estate cars that blend 4x4 abilities with car-like comfort levels. The latest in this line of Outback models aims to offer sleeker, more appealing exterior styling and a more upmarket interior. What hasn't changed, however, is the Outback's serious off-road credentials. It has plenty of ground clearance and a proper four-wheel drive system, which makes it a rival for the likes of 4x4 estates such as the VW Passat Alltrack, Skoda Octavia Scout and Volvo XC70 along with off-roaders including the Volvo XC60, Kia Sorento and Toyota RAV4. The Subaru Outback is the fifth incarnation of the Japanese company's off-road estate. Despite its serious off-road abilities – thanks to a substantial 200mm of ground clearance, high profile tyres and plenty of body protection – the Outback's main focus is comfort, with a pliant and smooth ride on and off the road. Thanks to its estate body, and increased size, interior space is another of the car's strong suits. The Outback's raised ride height may make loading heavy items into the boot a little tricky, but there is plenty of space on offer, with a large cubby underneath the boot floor. There's even a slot for the boot cover underneath the boot floor, meaning that you don't have to leave the luggage cover at home if you need to fold the seats down. Passenger space is also very generous, with a substantial amount of leg and headroom for those in both front and rear seats. The middle rear seat is also very usable, with more than enough room for reasonably tall adults, while the soft seats are all comfortable. The Outback is available with one petrol and one diesel engine. The 2.0-litre diesel motor puts out 148bhp, taking 9.9 seconds to accelerate to 62mph and is capable of 46.3mpg in 'Lineartronic' automatic form. CO2 emissions of 145g/km place the automatic in the £145 tax band, though the manual just breaks the 50mpg mark. The petrol meanwhile has a Lineartonic gearbox as standard and produces 173bhp, returning impressive claimed fuel economy of 40.4mpg and taking 10.2 seconds to sprint to 62mph. Two versions of the Outback are available – SE and SE Premium. Both are very well equipped with even the entry-level trim including dual-zone climate control, heated front seats, an electric driver's seat, electric folding wing mirrors, automatic LED headlights, a seven-inch touchscreen media system and 17-inch alloy wheels. Automatic models also include Subaru's new 'EyeSight' driver assistance kit, which automatically stops the car if it senses that you are about to hit the car in front. This system can bring the car to a complete stop, after issuing audio and visual warnings. Range-topping SE Premium models add a sunroof, leather seats, keyless entry, a start-stop button, 18-inch alloy wheels and a powered tailgate to the equipment tally. 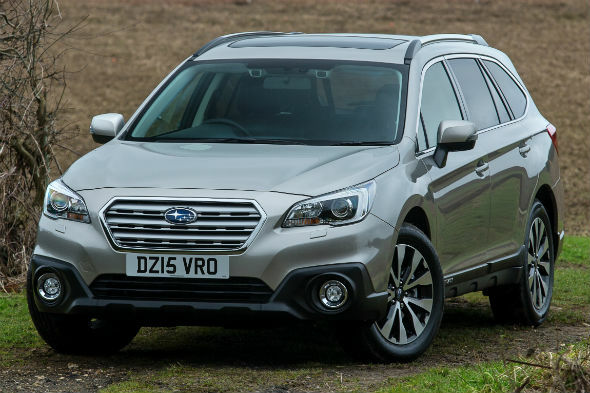 Prices for the Outback range from £27,995 to £32,995. The Outback competes with off-road versions of standard estate cars as well as more traditional off-roaders. The closest competitors for the Outback include the brand new Volkswagen Passat Alltrack, Skoda's 4x4 Octavia Scout and the Volvo XC70. All of these are available with raised ground clearance and four-wheel drive, though the Subaru places the emphasis more towards off-road ability than these models. Other off-roaders that potential Outback customers may be considering include the comfort-oriented Volvo XC60, the seven-seater Kia Sorento and the functional Toyota RAV4. Though it may offer some serious off-road abilities, the first impression of the Outback is how easy it is to manoeuvre. With very good visibility all-round, the driver has a clear view of the road ahead, and over their shoulder when changing lanes. We drove the diesel model with the Lineartronic automatic gearbox. This transmission feels well matched with the engine, changing gear smoothly enough and always offering power when you need it. The 2.0-litre diesel might not be the strongest of motors, but it provides adequate muscle for most drivers, as does the petrol. Though the overall refinement level is very high, with little road or wind noise, the tone of the diesel engine is audible when cruising and it can be loud when accelerating. The petrol engine is even more noticeable, roaring away under hard acceleration, though it is practically silent with gentler driving. We found the suspension very smooth and comfortable in the diesel with the 17-inch wheels fitted, though the petrol model fitted with 18-inch wheels was significantly firmer. The soft, supportive fabric seats fitted to SE models were particularly comfortable, however. The Outback's strongest suit is how capable it is over rough, rutted tracks, despite offering very high comfort levels on Tarmac. It may compete against a number of estate car-based 4x4s, but we're confident you'd get further off-road with the Subaru than most of these. For the price, the Outback also includes a long list of standard kit, while claimed economy figures are reasonable. It's even got some slick self-braking safety kit that works very effectively, stopping you from driving into the car in front. The interior design is a little dated, failing to offer the feeling of quality or style of German rivals, though. If interior style isn't high on your wishlist, however, the Outback is a good value, capable machine that offers plenty of space and high comfort levels.